An ophthalmologist or a surgeon performs eye surgery in order to rectify a problem that is in the eye of a patient, be it a muscle problem or the eye itself. Just like most other surgeries, optical surgery requires anaesthesia. There are a number of different eye surgery options, some of which will be discussed in this article. What are Eye Surgery Options are there? Cataract eye surgery is the commonest surgery carried out and the patient undergoing surgery for a cataract problem needs to find out as much information as possible regarding the steps involved during the procedure. For those people whose eyes have pacification of the lens, due to either disease or old age, they can have the flawed lens removed and replaced with an intra-ocular plastic one. After the procedure, the image that reaches the retina becomes much clearer. When one’s eye has more than enough aqueous humour, it raises the intra-ocular pressure and this leads to poor optic nerve functioning. This condition, dubbed glaucoma, can be surgically corrected through a process called canaloplasty. This procedure drains excess fluid using the eye’s drainage system. LASIK eye surgery is used in the rectification of a variety of eye conditions, including myopia and astigmatism. A flap is formed using a laser in the corneas and this leads to the correction of the patient’s eyes. This surgery is performed on people who do not wish to wear contact lenses, or glasses. LASEK eye surgery, which stands for laser assisted sub epithelial keratectomy, involves ablating a small piece of the corneal stroma. It is done differently from the LASIK eye surgery though the recipients of both surgeries want to avoid wearing glasses or contact lenses. Corneal eye surgery is a corrective eye surgery that involves removing a diseased cornea and replacing it with one that is healthy. 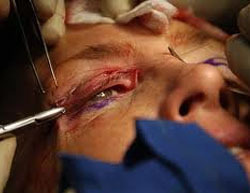 This surgery is used to correct total loss of vision. The eye can also be completely removed from its socket, though the muscles are left behind. This operation is done in cases where the eye is infected by cancer especially in children or in case the eye is in its last phase of glaucoma. Eye surgery options that are cosmetic include Botox treatments in the region of the eye, cosmetic eyelid surgery, and in some cases, eyebrow tattooing. This option is familiar with young people and the reasons for resorting to such treatments are usually aesthetically-based, therefore, they are, in most cases, not medically prescribed. The procedures are done in a very short period of time and the patient may immediately return back to his or her activities. This option includes Blepharoplasty, a procedure where the upper or lower eyelid is reshaped. Other procedures include the Botox surgery which is used to treat blepharospasm, a condition where one blinks excessively and another operation is known as Browplasty, a procedure also referred to as a forehead lift.